APS and Gallery Nayuta are pleased to announce Toshiya Kobayashi’s exhibition, which will be held from December 3 to 25, 2016.
a piece of space APS, which opened in November 2004, will become an art management office as of January 2017, and Kaori Sato (former director of Makii Masaru Fine Arts) will open Gallery Nayuta in the same space. From December 3 to 10, Kobayashi will exhibit a piece of work, as the APS shows have always done. Then he will re-exhibit the same space with different works for the opening show of Gallery Nayuta, which will be held from December 12 to 25. Kobayashi began his artistic activities in the 1980s. Currently, his activities are based in Japan and Europe. He has lived in Santa Monice, USA (1988-92); in Hamburg, Germany (2005-06), via selection of Japanese Government’s Overseas Study Program for Artists; and in Luzern, Switzerland (2012, funded by the ORYX FOUNDATION). In Japan, his major exhibitions include ones at Osaka Contemporary Art Center, Mori Art Museum, and The National Art Center, Tokyo. He has also held many solo and group exhibitions in Europe. Aside from exhibitions, his wide range of activities include commissioned public artworks, such as Hamburg City’s Public Art Project, artist-in-residence programs, and art fairs. He held a show for the opening of APS in 2004, and again in 2008, along with four other spaces within the building in which APS is housed. Kobayashi also participated in many shows at Makii Masaru Fine Arts. 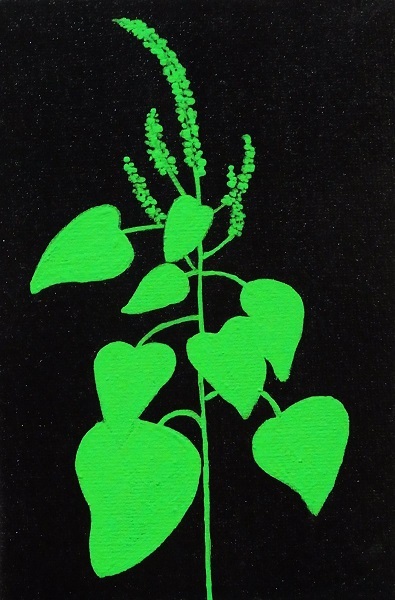 Please come and enjoy Kobayashi’s newest group of works that has embedded his feelings into images of plants, which derived from his thoughts toward various unsettling events that have occurred around the world in recent years. We look forward to your visit to this unique exhibition that marks the shift from APS to Gallery Nayuta.